From left, Wilson High alum Chase De Jong, Long Beach Poly alum JuJu Smith-Schuster, Lakewood High alum J.P. Crawford. 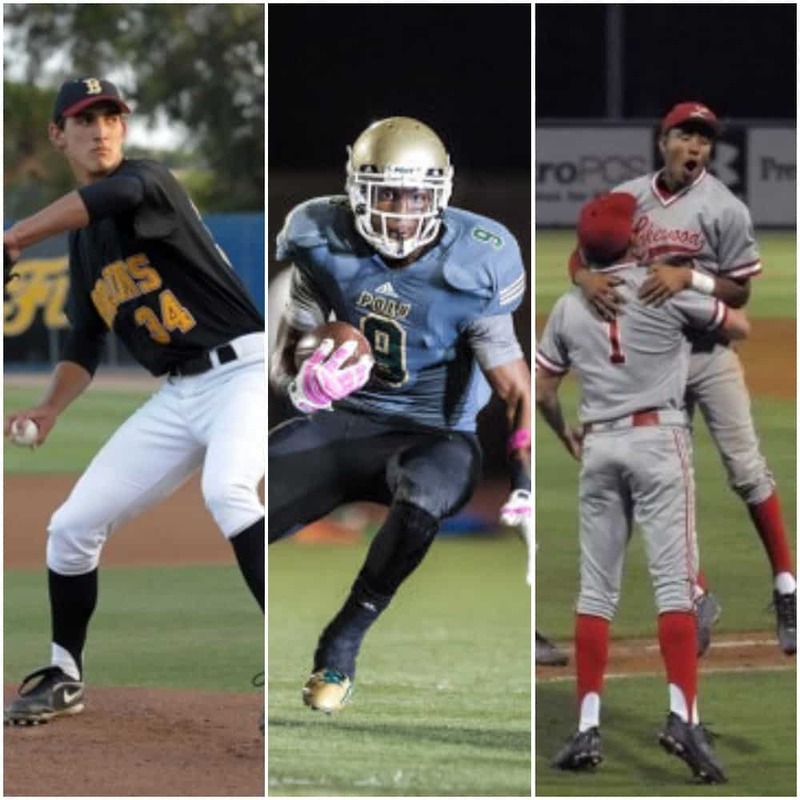 Long Beach has produced more professional football and baseball players than any other city in America, so it’s not surprising that more than 30 athletes with ties to Long Beach competed in the most recent National Football League and Major League Baseball seasons. It’s also not surprising that many of them have made some memorable headlines on and off the field over the last few months. Can you imagine receiving a raise, getting a promotion and having your first child in a four-day span? Cleveland Browns offensive lineman Joel Bitonio rode that emotional rollercoaster last week. The Wilson High alum was named to the Associated Press All-Pro team on Saturday, he and his wife Courtney had their first child, Zoey Grace Bitonio, on Monday, and he was named to the NFL Pro Bowl on Tuesday. Bitonio, who was as an alternate and will play in the game due to injury, is just the second Wilson alum to make the NFL Pro Bowl. Norm Standlee received the honor in 1941 and 1950. Bitonio was an award-winning football, basketball and track and field athlete at Wilson from 2005-08. After starting 39 consecutive games for the University of Nevada football team, Bitonio was selected by the Cleveland Browns in the second round of the 2014 NFL Draft. He’s started 63 games for the Browns, and signed a contract extension through the 2022 season. Cleveland had a resurgent season with new quarterback Baker Mayfield. The Browns went almost three full calendar years without a win—from Oct. 11, 2015 until beating the Jets in late September. It was surreal to see Troy Tulowitzki take ground balls at Blair Field last month. It’s the same infield where he played shortstop for the Long Beach State Dirtbags, and now he can read his name on the new batting cages. Tulowitzki and fellow Dirtbags product Jered Weaver donated over $1 million to build new batting cages and home bullpen that were completed two years ago. Tulowitzki, 34, was at Blair Field because he was released by the Toronto Blue Jays last month. However, his workouts coming off another injury impressed visiting scouts enough for him to ink a one-year contract with the New York Yankees. Tulowitzki will be the Opening Day starter for the Yankees, who will pay the majority of the $20 million left on that contract plus the league-minimum $555,000. Tulowitzki was a Dirtbag from 2003-05 and was named All-American as a junior. The shortstop hit .310 with 20 home runs in his LBSU career. “Tulo” was induced into the LBSU Hall Of Fame in 2013. After being selected by the Colorado Rockies with the seventh overall pick in the 2005 MLB draft, Tulowitzki helped the Rockies reach the World Series in 2007, and helped Blue Jays reach the American League Championship Series in 2015. He is a five-time All-Star, but hasn’t played an MLB game since July 2017 due to injuries. Long Beach Poly High alum JuJu Smith-Schuster made the most out of his second season with the Pittsburgh Steelers. Not only did the 22-year-old set records and make the Pro Bowl, he also laid the foundation for his future with smart endorsements. Smith-Schuster was top five in the NFL in both catches (111) and yards (1,426) this season, and is the ninth of more than 60 Poly alums in the NFL to make it to the Pro Bowl. While using his physical skills to succeed on the field, Smith-Schuster used his natural personalty to build popularity and endorsement deals. He has more than four million followers on his personal Twitter, Instagram and YouTube accounts, and currently has business partnerships with Pizza Hut, Postmates, Call of Duty, adidas, New Era, Monster, Kobe Bryant’s Art of Sports, and HyperX. Long Beach PONY has been one of the most successful youth baseball programs in California over the last 12 years, and it hosted another skills clinic last month at Whaley Park where former players came back to coach the kids. Wilson High alum and Long Beach PONY World Champion pitcher Chase De Jong was among the former players to run the drills. De Jong, 24, also plays for the Minnesota Twins, and he got married at the beginning of December, but he still found time to give back to his community. Poly High alum and defensive tackle Jurrell Casey, 29, was named to his fourth consecutive Pro Bowl after racking up 62 tackles, seven sacks and two forced fumbles for the Tennessee Titans this season. He’s the first Titans player to make four Pro Bowls. Poly’s Gene Washington and Millikan’s Gary Garrison are the only other Long Beach products to make four Pro Bowls. Washington and Casey are the only ones to go four consecutive times. This will also the first time three Long Beach products play in the same Pro Bowl with Casey, Bitonio and Smith-Schuster. The game is on Jan. 27 in Orlando, Fla.
Lakewood High alum J.P. Crawford has been one of the top MLB prospects for years, and the shortstop was traded from the Philadelphia Phillies to the Seattle Mariners after the season. Crawford, 23, was the 16th overall pick by the Phillies in the 2013 draft straight out of high school. He made his debut in September 2017, and played 49 games this season before a wrist injury derailed his season. He hit .214 with three home runs, 12 RBIs and 17 extra base hits this season while putting up a .931 fielding percentage. Poly alum Hayden Hunt signed a reserve/futures contact with the Tampa Bay Buccaneers this month to try and become the newest Jackrabbit in the NFL. Hunt, 25, was an All-American punter for Colorado State. He played football and baseball at Poly. Chase Utley was involved in two very different press conferences at Dodger Stadium last year. The first was to call an end to his 16-year career, and the second was to join American sports legend Billie Jean King during her introduction as a new minority-share owner. Utley and King both attended Hughes Middle School and Poly. Poly alum and Tampa Bay Buccaneers wide receiver DeSean Jackson, 32, set another NFL record in his 11th season by catching his 24th 60-plus-yard touchdown. That is the most in history, and it broke the record set by Jerry Rice. LBSU Dirtbags product Mike Marjama made his MLB debut less than a year ago, but the catcher decided to hang up his cleats this season and give back to a community that also shaped his life. Marjama, 28, told the Sacramento Bee last year that he struggled with an eating disorder as a wrestler at Granite Bay High School in Northern California. Now he is going to take a position as an ambassador with the National Eating Disorders Association to help those who are going through similar physical and mental difficulties.